The purpose of this study is the clinical and histopathological evaluation of percutaneous collagen formation in atrophic acne scars after dermal roller application. This prospective study was conducted from January to October 2012, it was approved by the Ethics Committee and written informed consent was obtained from all participants before enrollment. Overall, 14 patients (6 men and 8 women) with different types of atrophic acne scars were enrolled in this study of which 12 completed the study (five men and seven women). Inclusion criteria were age ≥ 18 years and any type of facial atrophic scars (icepick, boxcar and rolling). Exclusion criteria were systemic retinoid or immunosuppressive drug intake during the previous 6 months, coagulation defects or hematological diseases, evidence or history of keloid scar formation and history of facial laser treatment, surgical procedure or dermabrasion 6 months before study enrollment, presence of skin cancer, warts, solar keratoses or any skin infection, patients with a medical condition that might have influenced the wound healing process, pregnancy and unrealistic expectations. Patients were allowed to continue previous acne medications during the study period, except isotretinoin. PCI treatment was performed for all patients. Each patient received seven sessions of treatment at 3-week interval. Patients were instructed to avoid medications such as aspirin and nonsteroidal anti-inflammatory drugs (NSAIDs) for at least 1 week before the session and to start using topical retinoid 2 weeks before each session, stopping 2 days before the session to avoid irritation to the skin. Three millimeter punch biopsy specimens of untreated scars were obtained from the 12 patients before treatment commencement, and after the seventh session (at 18 weeks). A third biopsy was taken from two volunteer patients at 8 weeks after final treatment (after 26 weeks of study). Punch biopsy specimens were fixed in 10% neutral buffered formalin, embedded in paraffin and sectioned at a thickness of 5 μm; three stains were used: Standard Hematoxylin and Eosin (H and E), Masson's trichrome stain (Biotech, code KT034) and Picrosirius red (Via Marche, 19, DDK, Italia S.R.l). Picrosirius red (PR) stain was applied as follows: The deparaffinized sections were hydrated, stained with Weigert`s hematoxylin (8 minutes for nuclei), and stained with PR (1 hour). Then all sections were dehydrated, cleared in xylene and mounted with DPX. The PR-stained sections were analyzed using an Olympus microscope (U- MDOB3, Japan) equipped with Simple Polarizing Attachment (BX-POL, Olympus, Japan); it consists of two filters to provide circularly polarized illumination; A Polarizer (U-POT) (circular polarizer) and an Analyzer (U-ANT). These two filters were aligned to obtain a dark field; tissue images were obtained with different objective lenses and recorded on a digital Camera (E330-DC 7.4V, Olympus, Japan). Statistical analysis was performed with Wilcoxon signed rank test (for comparison of before and after dermal roller treatment) and Student T test using SPSS software (version 16, SPSS Inc., Chicago, IL). Data were expressed as mean and standard deviation. Twelve patients (five men and seven women) were enrolled in this study. They completed the 26-week study without any significant adverse effects. Age of patients ranged from 20 to 31 years mean ± SD (25.9 ± 4.3 years). The mean duration of acne scars was 4.3 years (range 2-8 years). Detailed ECCA scores of all patients are listed in [Table 1]. Dermal roller treatment induced a statistically significant improvement in acne scars. Consistently, ECCA scores were significantly reduced following PCI after 26 weeks (123.3 ± 24.5 → 74.16 ± 16.49) (P = 0.0.00). There was a highly significant decrease in the mean score of all types of atrophic acne scars after PCI treatment [Table 2]. 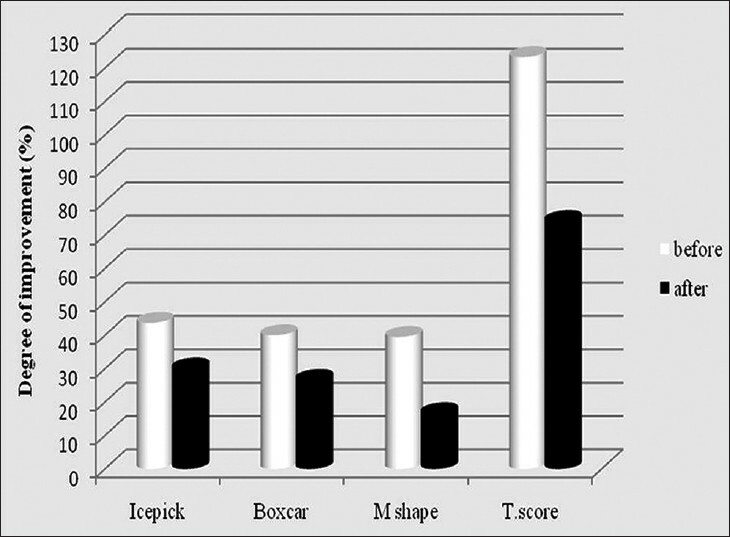 The Wilcoxon signed rank test showed highly significant decline in icepick, boxcar and rolling scars, total ECCA grading score at 26 weeks treatment (P = 0.001, 0.005, 0.005, 0.002, respectively) with variable degree of improvement but not statistically significant difference in mean percentage of improvement between different types of atrophic scars (icepick, boxcar or rolling) (P = 0.16), [Table 2], [Figure 1] and [Figure 2]. No significant difference between male and female cases in their severity score (ECCA) both before and after treatment was observed (P = 0.65 and 0.45 respectively). No significant correlation was seen between the degree of improvement and scar duration. The post operative punch biopsies (at 18 and 26 weeks) recorded the following histopathological changes. The epidermis, particularly the stratum corneum, remained intact except for minute holes, which were about 2-4 cells in diameter [Figure 3]d with more developed rete ridges and unremarkable changes in melanocytes. Masson's trichrome-stained sections revealed more collagen deposition in the dermis in the form of blue fibers arranged in a lattice pattern [Figure 3]e. A background of neovascularization, proliferating fibroblasts and scarce inflammatory infiltrate was noted in both previous sections. Discrimination between newly synthesized collagen fibers and old ones could be difficult to assess at both levels. Polarizing light assessment of PR stain confirmed all previous findings with more detection and qualifications of dermal collagen content. Superficial dermis showed newly formed thin collagen bundles as green-colored birefringence, dissecting the old thick collagen bundles which appeared orange-red colored birefringent [Figure 3]f.
An interesting finding was noticed in post procedure punch biopsies done at 26 weeks; we could assess gradual replacement of thin green birefringent collagen fibers by more mature yellow birefringent ones. After PCI as collagen matured; the optical properties of the fibers showed signs of increase in birefringence from green to yellow [Figure 3]i and [Figure 4]. For collagen assessment, histopathological examination of pre- and post procedure scars was done, using three different stains (H and E, Masson's trichrome and PR stain). To overcome all previous disadvantages, we used PR stain in addition to traditional ones to assess collagen fibers; PR could stain the thin collagen fibers, did not fade and was suitable for use by polarized light microscope as described by Rich and Whittaker, 2005. Thus, the combined use of PR stain and simple polarized light enabled us to detect, analyze and qualify collagen content. 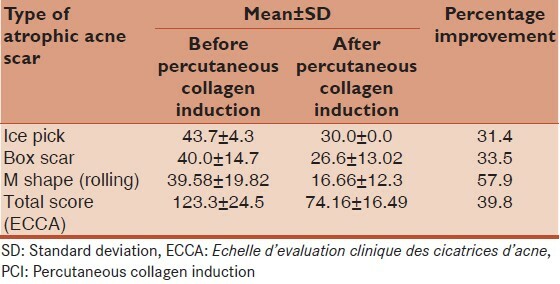 The current study compared collagen deposition in acne scars pre- and post-operatively at the end of treatment (18 and 26 weeks); pre-operative collagen fibers were arranged in parallel pattern with lack of newly formed thin capillaries and fibroblasts while post-operative biopsies showed increased collagen deposition which was laid down in normal lattice pattern along with newly formed thin capillaries, proliferating fibroblasts and scarce inflammatory cells (H and E and Masson's trichrome stained sections). This was in agreement with several studies; ,, Fernandes and Signorini, 2008 reported considerable greater collagen deposition 4-6 months postoperatively. We identified the recent thin collagen fibers at the end of treatment (18 weeks) as green to yellow birefringence in comparison to the old thick fibers of pre-operative acne scars that appeared orange-red birefringent as visualized by polarized light of PR-stained sections. The results were in accordance with Rich and Whittaker, 2005,  who found a time associated shift from green to orange in PR-stained fibers within myocardial scars. Hence we used PR stain for qualification of types III and I collagen fibers. Whereas type III recent collagen fibers appeared thin green to yellow birefringent in the superficial dermis, the thick old orange to red birefringent collagen fibers (in atrophic acne scars) represented type I collagen fibers, PR stain is therefore a good qualitative method for further classification of collagen fiber types (types III and I). Skin needling is a simple and minimally invasive procedure with rapid healing. The combined use of PR stain and simple circular polarizing system could assess change in the optical properties of collagen fibers from green to yellow to orange to red birefringence according to their maturation process and fiber' thickness. Ramesh M, Gopal MG, Kumar S, Talwar A. Novel technology in treatment of acne scars: The matrix tunable radiofrequency technology. J Cutan Aesthet Surg 2010;3:97-101. Kim HJ, Kim TG, Kwon YS, Park JM, Lee JH. Comparison of a 1,550 nm erbium: Glass fractional laser and a chemical reconstruction of skin scars (CROSS) method in the treatment of acne scars: A simultaneous split-face trial. Lasers Surg Med 2009;41:545-9. Fernandes D, Signorini M. Compacting photoaging with percutaneous collagen induction. Clinics in Dermatology 2008;26:192-9. Fernandes D. Minimally invasive percutaneous collagen induction. Oral Maxillofac Surg Clin North Am 2005;17:51-63, vi. Flabella AF, Falanga V. Wound healing. In: Feinkel RK, Woodley DT, editors. The Biology of the Skin. New York: Parethenon Publishing Group; 2001. p. 281-99. Liebl H. Reflections about collagen-induction-therapy (CIT). A hypothesis for the mechanism of action of collagen induction therapy (CIT) using micro-needles (On-line). Available from: http://www.genuinedermaroller.com.au/science/how-it-works. [Last accessed on 2009 Mar 30]. Dreno B, Khammari A, Orain N, Noray C, Mérial-kieny C, Méry S. et al. ECCA grading scale: An original validated acne scar grading scale for clinical practice in dermatology. Dermatology 2007;214:46-51. Fabbrocini G, Fardella N, Monfrecola A, Proietti I, Innocenzi D. Acne scarring treatment using skin needling. British association of dermatology. Clin Exp Dermatol 2009;34;874-9. 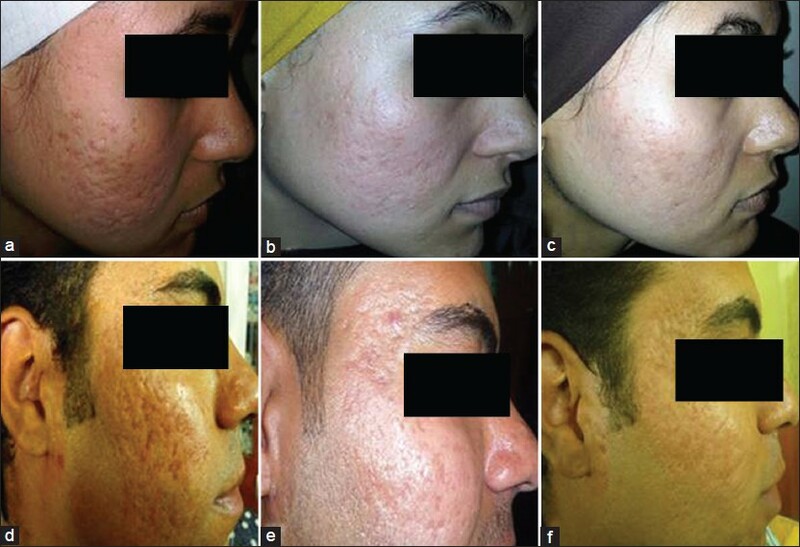 Majid I. Microneedling therapy in atrophic facial scars: An objective assessment. J Cutan Aesthet Surg 2009;2:26-30. Kiernan JA. Methods for connective tissue. In: Kiernan JA, editors. Histological and Histochemical Methods: Theory and Practice. 3 rd ed. London: Arnold; 2002. p. 144-63. Whittaker P, Kloner RA, Boughner DR, Pickering JG. Quantitative assessment of myocardial collagen with picrosirius red staining and circularly polarized light. Basic Res Cardiol 1994;89:397-410. Sweat F, Puchtler H, Rosenthal SI. Sirius red F3BA as a stain for connective tissue. Arch Pathol 1964;78:69-72. Rich L, Whittaker P. Collagen and Picrosirius red staining: A polarizes light assessment of fibrillar hue and spatial distribution. Braz J Morphol Sci 2005;22:97-104. Moon JC, Reed E, Sheppard MN, Elkington AG, Ho SY, Burke M, et al. The histologic basis of late gadolinium enhancement cardiovascular magnetic resonance in hypertrophic cardiomyopathy. J Am Coll Cardiol 2004;43:2260-4. Nart P, Williams A, Thompson H, Innocent GT. Morphometry of bovine dilated cardiomyopathy. J Comp Pathol 2004;130:235-45. Ophof R, Maltha JC, Von den Hoff JW, Kuijpers-Jagtman AM. 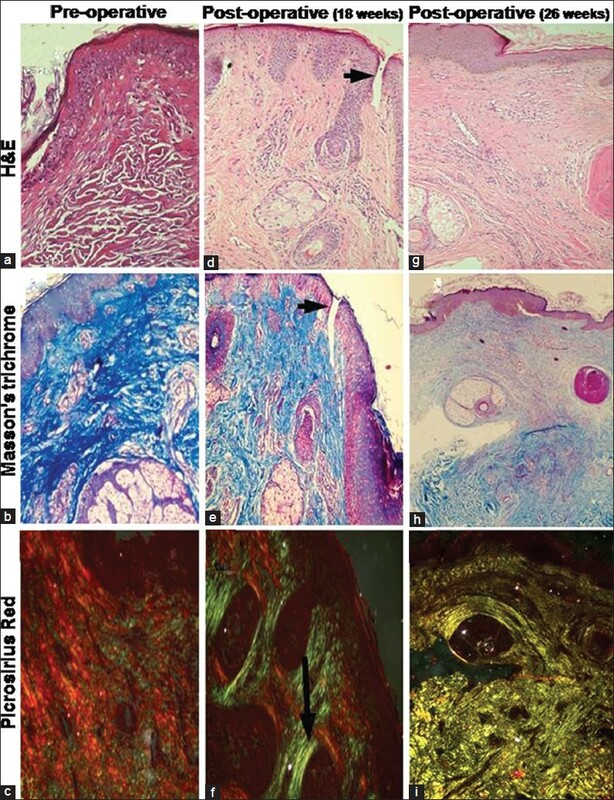 Histologic evaluation of skin-derived and collagen-based substrates implanted in palatal wounds. Wound Repair Regen 2004;12:528-38. Whittaker P, Canham PB. Demonstration of quantitative fabric analysis of tendon collagen using two-dimensional polarized light microscopy. Matrix 1991;11:56-62. Puchtler H, Waldrop FS, Valentine LS. Polarization microscopic studies of connective tissue stained with picrosirius red FBA. Beitr Pathol 1973;150:174-87. Aust MC, Reimers K, Repenning C, Stahl F, Jahn S, Guggenheim M, et al. Percutaneous collagen induction: Minimally invasive skin rejuvenation without risk of hyperpigmentation-fact or fiction? Plast Reconstr Surg 2008;122:1553-63.
el-Domyati M, el-Ammawi TS, Medhat W, Moawad O, Brennan D, Mahoney MG, et al. Radiofrequency facial rejuvenation: Evidence-based effect. J Am Acad Dermat 2011;64:524-35. Junqueira LC, Cossermelli W, Brentani R. Differential staining of collagens type I, II and III by Sirius red and polarization microscopy. Arch Histol Jap 1978;41:267-74. 1 Microneedling for the treatment of hair loss?